As an educator, I’ve always tried to teach my students the importance of persistence in following your life dreams. This last year, I have been purposefully trying to practice what I teach, as I have been working diligently on my first book. I am super excited to let you know that it’s now out! Lavalino Finds His Forever Home was just published and is available on Amazon and elsewhere as both an ebook and a print version (it is also in the Amazon lending library until March). 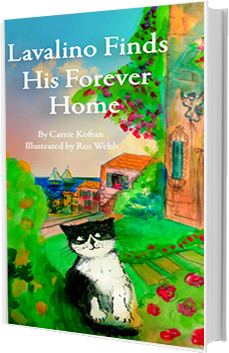 It’s been such a passion project of mine, particularly because the central character is based on a cat who was important to our family, and I put a lot of love and work into it. This is the first book in a series, The Adventures of Lavalino, and it introduces the scrappy and loveable street kitty as he searches for a forever home. The story is set in Sicily, Italy, and readers, parents and teachers get a flavor of the country’s people and culture. The colorful watercolor illustrations add to the story’s appeal. The back contains a glossary of the Italian phrases used throughout the book, and gives a touch of the language for young readers. Please check out the book and let me know what you think. Positive reviews are helpful and welcome! Thanks so much!